Learn more about Key Drugs pharmacy and meet our team. Key Drugs is a family tradition and is the oldest drug store in Butler County. It is one of the first drug stores in Missouri to be located in a shopping center. Our knowledgeable pharmacists use their vast experience to provide quality service. Our large staff allows us to fill prescriptions quickly and give all of our customers the personalized care they appreciate and deserve. Why wait in line and be just a number, when you can get prompt personalized service from pharmacists that know your name and treat you like a friend and a neighbor? We offer free in-town delivery and accept all Medicare Part D plans and most insurances. To assist you with one-stop shopping, Key Drugs has a U.S. Post Office inside the store to handle all of your postal needs. We carry a large inventory of home medical equipment and ostomy supplies. If you have Medicare and a supplemental insurance, Key Drugs can usually supply your Diabetes Supplies to you at no cost. Marty Michel, R.Ph., M.B.A., C.D.E., CDME, C.F. Julita has been with Key Drugs since 1994. She has a Bachelor’s of Science degree in Business Administration and Accounting that she received through Southeast Missouri State University. Before her employment with Key Drugs she was an office manager with Superior Business Products. She has also been trained in CPR. Julita is very involved with the Animal Welfare Alliance of Southeast Missouri (AWA) and currently she is an executive board member and treasurer of AWA. Julita is also a member and treasurer of the Senate Bill 40 Butler County Board of Directors for the Board of the Handicapped. Jennifer has been with Key Drugs since 2006 and received her Pharm. D degree from UMKC in June 2006. 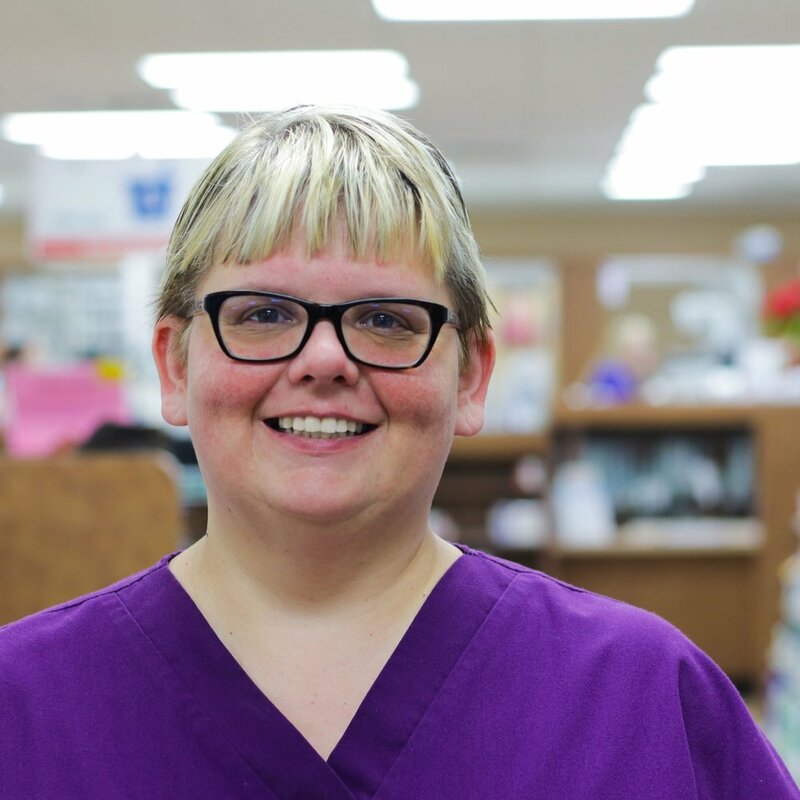 She graduated high school from Neelyville, MO and obtained a Pre-Veterinarian degree from TRCC before attending UMKC to further her degree as a pharmacist. She holds a certificate in compounding medications as well as CPR & AED training. Jennifer is also a licensed immunizer for vaccination such as the flu vaccine. Shelly has been with Key Drugs since 2012. She graduated from Poplar Bluff in 2004 and earned her doctorate in pharmacy from UMKC in 2011. Shelly is a pharmacist and licensed immunizer for vaccinations. She also works with our patients on Medication Therapy Management, which helps patients manage medications and teaches them how to take prescriptions properly. Shelly enjoys running, tennis, hiking and spending time with her family. Rebecca graduated from Jackson High School in 2009 and earned her doctorate in pharmacy from STLCOP in 2017. In her spare time, she enjoys reading, listening to and playing music, watching documentaries and movies and spending time with family and friends. Brandy has been employed with Key Drugs since 2015. She graduated from St. Louis College of Pharmacy in 2000 and went to work as a Pharmacy Manager at Walgreens. She also was a Director of Pharmacy at Missouri Southern Health. Brandy enjoys golfing and cooking. Brandy is a licensed Pharmacist with certifications in Travel health, Immunizations and Health, weight loss and fitness. Robin has been with Key Drugs since 2009. He has had a B.S in Pharmacy since 1973 from St. Louis College of Pharmacy and graduated from high school in Hannibal, MO. Robin worked as a retail pharmacist for 8 years (1973-1981) before he began his career as a sales representative. He worked as a Senior Executive Sales Representative for 28 years for the company Eli & Lilly, and while working with them was exposed to training in diabetes, women’s health, and mental health. Robin also brought the insulin, Humulin to market in 1982. He holds a certificate in CPR, AED and compounding. While not working he enjoys golfing, hunting, fishing, traveling, and experiencing the taste of different foods. He has been married for 33 years, has 2 daughters, and also 2 granddaughters. Teresa has been with Key Drugs since 2009. She graduated high school from Corning, AR and attended ASU where she received her CDA. Previously she worked as a pharmacy technician at Wal*mart Pharmacy in Corning, AR for 7 years. Teresa has been trained in CPR and holds a CDL license. When she is not working, she enjoys shopping, traveling, and bike riding. Teresa is married and has one daughter. Crystal has been employed with Key Drugs since 2013. She graduated from Poplar Bluff High School in 2000 and graduated college in 2002 from Southern Cal State San Bernadino, CA. She has worked in the medical field for 12 years with focus on respiratory. She also has worked DME for the last 8 years. 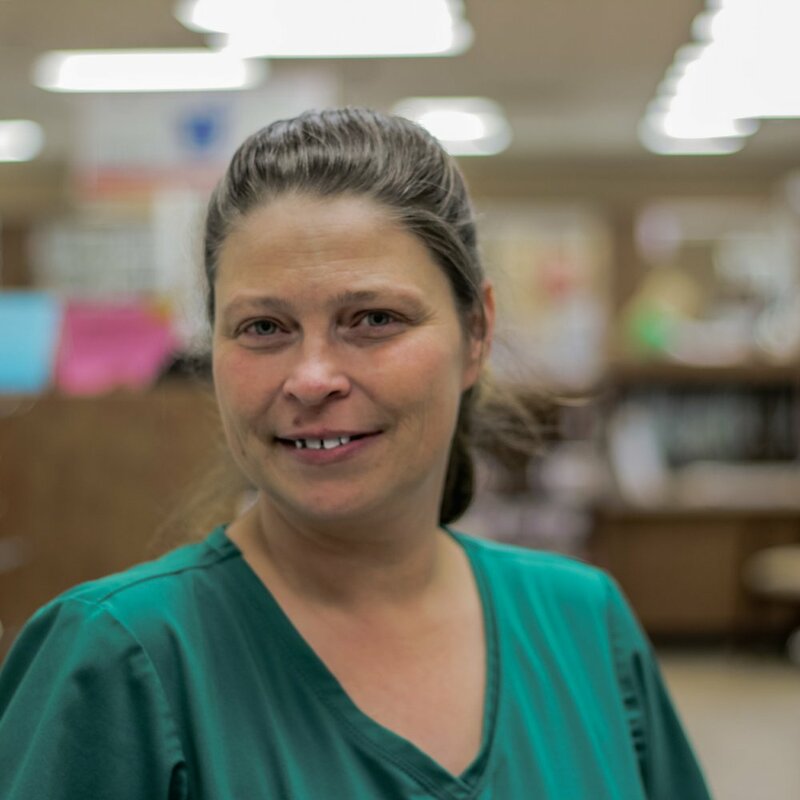 Crystal lives in Poplar Bluff with her husband and two daughters. Crystal enjoys spending time with her family, hunting and fishing, and coaching her daughters’ sports team. Lee graduated from Neelyville High School in 2014 and has an AA in agriculture. In her free time, she enjoys being outdoors and spending time with friends and family. Helen has been with Key Drugs since 2009. She is a graduate of Poplar Bluff High School and has attended classes at TRCC. When not working she enjoys doing yard, puzzles, fishing and reading. Michelle graduated from Twin Rivers High School in 1991 and joined the Key Drugs family 2018. She enjoys crafting and helping our customers. Amy has been employed with Key Drugs since 2015. She graduated from Puxico High School in 1991 and has attended courses at TRC in Poplar Bluff. Amy is married with 2 sons and enjoys the outdoors, her church and making crafts. Amy has a CNA license and is EMT certified. She has worked in Home Health and Hospice for 11 years. Katie has been with Key Drugs since 2008. She is a graduate of Twin Rivers High School. Katie has worked at J&H Express as well as Super Saver. Katie is a licensed pharmacy technician. She has two sons and enjoys photography and shopping when she is not working. Leanna graduated from Woodward High School in Toledo, Ohio. and started with Key Drugs in 2012. She likes playing softball and volleyball, traveling and working out. Karen has been with Key Drugs since 2012. She graduated from Greenville High School in 1985. She has been a Pharmacy Technician for 25 years. She is in charge of the Med Sync program that helps get all medications on the same day for patients. Some things Karen enjoys are attending church, spending time with her wonderful husband, children, grandchildren, family and friends. She also enjoys riding 4-wheelers, flea marketing for vintage items, shopping and going to the movies. Kristin has been employed with Key Drugs since 2015. She graduated from Dexter Senior High School. Kristin is a Licensed Pharmacy Technician. She enjoys reading, playing with her puppies and spending time with her family and friends during her spare time. Lesa graduated from Ultimate Medical Academy and joined Key Drugs in 2013. While not at work, she enjoys fishing, hunting and painting on canvas. Lesa has nine wonderful grandkids with grandbaby ten on the way! Ashley graduated from East Cart RII and started with Key Drugs in 2004. In her spare time, she enjoys barrel racing, reading and spending time with her husband (Justin) and daughter (Charleigh). Donnia has been with Key Drugs since 2013. She went to Naylor High. Donnia is a cashier, sales clerk and she works in the post office. Donnia enjoys dancing and working in the yard during her free time. 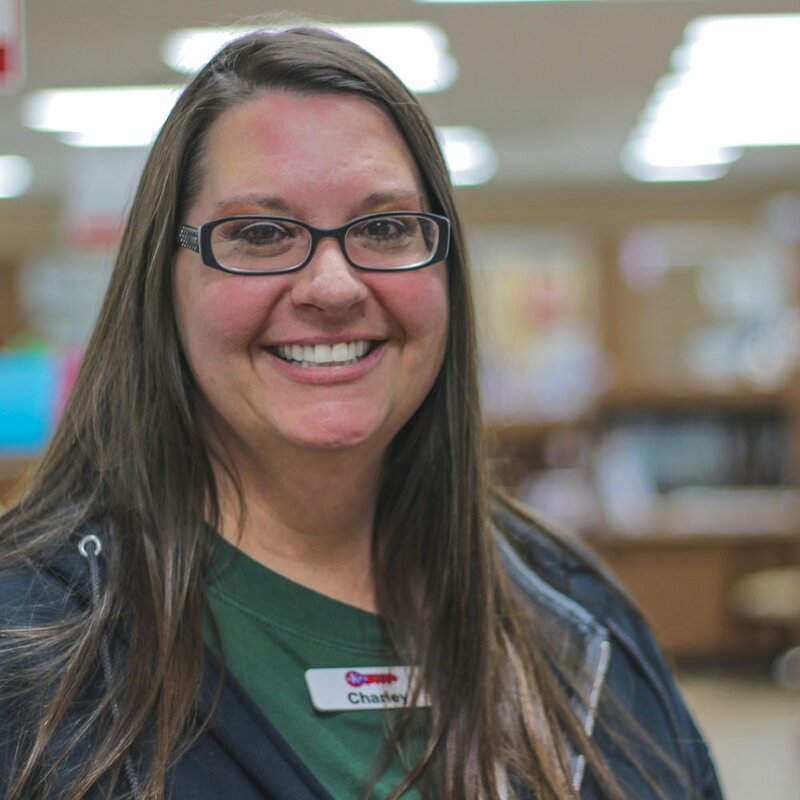 Jennifer graduated from Poplar Bluff High School in 1998 and has a paraprofessional degree from TRC. While not at work, she enjoys reading and spending time with family. Rhonda has been employed with Key Drugs since 2014. She graduated from Doniphan High School in 1981. Rhonda has 3 children and 3 step daughters; she is married and has three Shih Tzus (dogs). Rhonda works at the register and helps people picking up their prescriptions. Rhonda loves to read and travel in her spare time. Vickie has been employed with Key Drugs since 2015. She is married with 2 children and 4 grandchildren. Vickie enjoys going to all the activities that her grandchildren are in. She enjoys reading and being with her family and friends. Maci works as needed at the pharmacy and is a licensed LPN. Jason graduated from Dexter High School in 2008 and has attended Arkansas State University for Music Education. In addition to being a pharmacy tech, he helps with technology related issues in the pharmacy and manages the website and Facebook page. Jason joined Key Drugs in 2014. Sheila has been employed with Key Drugs since 2014. She graduated from Poplar Bluff High School and went on to get a degree in Medical Billing and Coding from TRC. Sheila is married and has two daughters. She is about to become a grandma in November and couldn’t be more excited. Sheila enjoys horses and barrel racing in her spare time. Janice has been employed with Key Drugs since 2015. She graduated from Three Rivers College with a degree in Business Management. Janice is married with three children and three grandchildren. She enjoys watching old movies and surfing the internet. Lori has been with Key Drugs since 2003. She graduated from high school in Missouri City, TX. When she is not working, she enjoys her grandchildren and hanging out with friends. Heather graduated high school from Hammond Christian Academy and has a bachelors degree in Theology from Indiana Bible College. and joined Key Drugs in 2018. In her free time, she is very involved in her church (New Life Apostolic Tabernacle) where she does music.